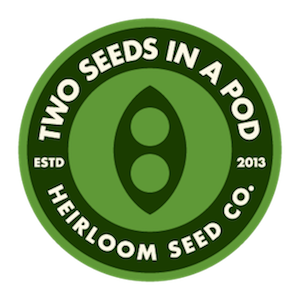 Two Seeds in a Pod is a family and farmer-owned heirloom seed company that was founded in 2013 by Dr. Mehmet Öztan. We specialize in Turkish heirloom vegetables and, as of 2017, offer more than 130 varieties of vegetables and herbs from all around the world. In the upcoming years, we will also focus on Appalachian heirloom seed preservation projects, and we are hoping to offer many heirloom varieties from West Virginia in our catalog, beginning in Fall 2019. Our seed catalog mostly consists of rare heirloom seeds and we are the only seed source in the U.S. for many of these seed varieties. We publish our seed catalog twice a year through our online newsletter. The primary principles for offering a specific variety of seed in our catalog are the following: historical background of the variety and that delicious “from our childhood” taste the heirlooms have. At the same time, we also want to provide seed varieties that are good producers. We are driven by nutritional values, quality and appearance of a specific variety, and not necessarily by how large its fruits grow. All of our seeds are non-GMO and non-hybrid and we have happily taken the Safe Seed Pledge. None of our seeds are treated or patented, we grow all of our seed stock naturally. Our seed research and production farm was located in Tampa, FL, between 2013-2015 and in Thonotosassa, FL, between 2015-2018. As of July 2018, we moved to Morgantown, WV. We are currently transitioning to our new farm location and our company’s home-base in Reedsville, WV. In the past, we also produced vegetables for Temple Terrace Farmers’ Market and collaborated with Chef Gregory Seymour of Pizzeria Gregario (Safety Harbor, FL) to improve the conceptual understanding of the farm-to-table notion in the Tampa Bay area and to evaluate our seed introductions further, through their culinary use.